“A Way That Seemeth Right” from Christian Faith Publishing author G.W. Whittington is the story of a small town devastated by drugs and the Cartels. This is the tale of a vigilante who does what seems right in a town where everything is all wrong. Published by Christian Faith Publishing, G.W. Whittington’s new book is the tale of a town in need of a hero. Young Gauge McLane somehow managed to survive the massacre in a small South of the border church. When Sheriff Hank Maddox finds the boy wandering through the back roads of San Reno, he decides to take the young orphan in and raise him. Things are not well in this small town. Drugs have a grip on the youth. Corrupt officials will do anything to get their hands on a mysterious book that could destroy the Mexican Drug Cartels and their American counterparts. Just when it seems the whole world has gone mad and evil is about to achieve victory, a vigilante comes from out of nowhere. No one knows if he is a good guy or a bad guy. They just know he fights the bad guys. View a synopsis of “A Way That Seemeth Right” on YouTube. 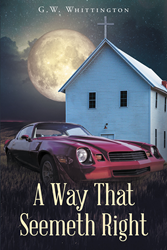 Consumers can purchase “A Way That Seemeth Right” at traditional brick & mortar bookstores, or online at Amazon.com, Apple iTunes store, or Barnes and Noble. For additional information or inquiries about “A Way That Seemeth Right”, contact the Christian Faith Publishing media department at 866-554-0919.